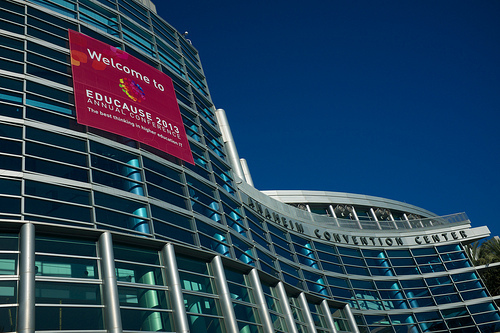 A couple of us attended the EDUCAUSE Annual Conference held this year in Anaheim, California from October 15-18. The conference program is derived from member-driven content organized across six overarching IT domains including: Data/Information Access and Management; Enterprise and Infrastructure; Leadership and Management; Security, Privacy, and Compliance; Services and Support; and Teaching and Learning. This is a huge conference; I heard there were roughly 7000 people in attendance – 7000 folks all interested in educational technologies and their application across universities, colleges, schools, corporate training institutes and other contexts. The opening keynote of the conference was delivered by Sir Ken Robinson, an internationally recognized expert on creativity and innovation and the author of several books on these topics. I have followed Ken for a while after watching his popular How schools kill creativity TED lecture from 2006. In this keynote, titled Leading a Culture of Innovation Ken spoke of the incredible power of imagination to visit the past, imagine the future and empathise with others. His point being that we encourage and refocus imagination and creativity in education. However Ken commented that imagination does equal creativity, imagination fosters creativity. But creativity is a process and not simply an event, which means it requires some sort of doing or action, which seems to imply the need for active learning. Further complicating things is the question of how to judge creative works, whose values apply to the assignment of value on creative works? My thoughts here are that as long as one can describe and reflect on their own creative process, link their works to existing concepts / other works, and situate their creativity in a meaningful way – we can assign value to how well a student expresses these supporting structures of their creative works, and perhaps link assessment in a practical way. Ken used the example of the iPhone and subsequent innovation now seen in the Apple App Store – when the iPhone launched the App store had roughly 800 applications available. Now we see nearly a million apps available in the app store, many of which Apple could have never envisioned when launching the platform. Ken used the interesting video below to demonstrate his point further. One group of students in a third grade classroom were given the instructions “those who complete the painting the right way will get one point” while another group were given the instruction “complete the painting”. The results are quite interesting as the first instruction assumes a single correct answer, while the second instruction allows for much more creativity. A fascinating experiment, which certainly makes me think about how I frame instructions when working in my own training context. I heard some critique of Ken’s keynote, but I found it to be inspiring and well delivered. A good start to the conference. I attended a number of sessions on analytics; mainly with a focus on identifying at risk students. A presentation from the New York Institute of Technology (NYIT) called “Who Are Your At-Risk Students? Using Data Mining to Target Intervention Efforts (PPT) ” described one such project where multiple data sources were unified to develop a model of at potential at risk students. In this case SQL Server Integration/Analysis Services was being used to build a data warehouse of student information sourced from admissions, registration, finance, student records as well as survey data. One of the lessons learned from this project was the highly contextual nature of identifying at risk students. Measures identified from other similar projects did not apply in the case of NYIT, and the presenters emphasised that any such initiative must take into account the local context of the students. The take away here for me was that we are far from solving the problem of identifying students at risk, initiatives must take into account multiple institutional data sources and the local context of the student body. A session entitled “MOOC Data Analysis: Open-Source Code for Open Education” presented by folks from Indiana University in partnership with Google proved to an interesting showcase of the Google Course Builder Project. The presenter from Google warned of building online courses which simply “televise the radio”, an analogy that I quite liked. Indiana University has waded into the MOOC arena and launched their first MOOC on Information Visualization built with the Course Builder software. Interesting to note that the MOOC had to also make use of Drupal to allow for student discussion through Drupal forums; I was surprised to see this basic functionality not built into the Course Builder software. To handle the volume of questions coming in on forum posts, users were able to rate up particular forums helping the instructor identify where to intervene, which seemed to work well in this case. Google has built up a neat little resource of advice for designing an online course in their documentation which I believe deserves a closer look. Google also showcased their Introduction to web accessibility MOOC also built on the Course Builder platform which I will take a closer look at, nice to see it is licensed under Creative Commons. Another analytics session titled “Do Clicks Count to Increase Student Achievement? Learner Analytics on a Large-Enrollment Hybrid Course (PPT and Report)” provided feedback on research in which learning management system (LMS) activity logs were measured against student success in specific courses. In this case the researcher found a coorelation between time spent in the LMS and course grade and was actually a better predictor than traditional indicators. The argument here was that it is wha students’ do in the course, not where they come from that determines their success. Back in 2011 I did a similar study with my colleague from the University of Cape Town measuring LMS activity versus course grade in we found little correlation. The difference of course is that we were analysing data from a mostly residential course and this study analysed a hybrid course. Key takeaway here was that perhaps click do count, but more importantly clicks count when online learning activities are well designed to expose data which might become valuable learning analytics creating opportunities for intervention. I thoroughly enjoyed the presentation from Worcester Polytechnic Institute (WPI) entitled “Lecture Capture: An Accessible Technology (PPT and other resources)” WPI currently has roughly 18 of their teaching venues equipped for lecture capture, with fixed cameras and Echo 360 capture stations. Lecture capture is used for supplementing and augmenting traditional lectures, flipped classroom experiments, lab instructor review, and adhoc recordings during pandemic or weather closures. A point raised was the value of recorded lectures for English as a second language students, which I heard echoed in our recent international student panel where student reflected on what helps them learn here at VIU. Having the ability to replay or review a lecture you have attended can be incredibly valuable whether you are learning English or not. I have to get to work encouraging more faculty to at least podcast their lectures so that students can review them at their leisure. Education as establishing oneself as a node in a broad network of distributed creativity; connecting to the right resources, people, networks, culture, language in your selected field. This resonates well with my current philosophy on education. Utah State University (USU) presented on “Creating a Successful Distance Learning Environment“. USU delivers 400 distance education courses weekly to students across the state using a video conference solution. Brick and mortar institutions throughout the state participate through a state wide fibre optic network which really helps with the transfer of video between sites. USU uses fixed lecture capture recording hardware in their venues and they have gone to lengths to ensure common classrooms throughout the campus network, so even a remote viewer will be in a similar environment to the capture venue. One key takeaway here was USU’s method for ensuring quality in the broadcasts. Student ambassadors are used to support the instructor when doing the broadcast, helping the instructor with any technical issues and watching the live feed to ensure the experience is quality for remote viewers. They have gone so far as to develop a rubric for assessing broadcast quality which I hope to be able to obtain from USU. Purdue University shared their experience using “Digital Badges as a Passport to Student Learning” as a way to recognize learning in all of its forms providing a visual learning transcript and portfolio for showcasing student work. The current transcript that universities provide was likened to a store receipt, or a “receipt for your learning” which could be considered a little formal and boring. Purdue is challenging their registrar to innovate upon the transcript and consider graphic badges and visual awards for student learning as part of the transcript. Things got quite interesting as their were a number of participant with registrar related roles in the room asking really good questions about how this might all work (Here I could really see the value in the EDUCAUSE conference, as it really brings together the right people to have these debates). Badges have the potential to enhance the transcript as the badge issuer can be linked as a credential themselves. The example given was of a guest lecture and assessment activity from a a prominent Nobel Prize winning academic in a Purdue Course; traditionally the student would get a transcript entry for the course, but the interaction with that guest lecturer would not be recognized through the transcript. If the guest lecturer was able to award a badge for successfully completing the lecture and assessment, the student would be able to better share the experience gained through the interaction with the Nobel Prize winning academic. An open badges system is currently being developed by Mozilla and supported by the Macarthur Foundation. Badges incorporate some aspects of gaming into education as students can use badges to ‘level up’ and can collect and compare badges with others. Badges can also be shared on line and added to visual resumes which are becoming increasingly popular. In fact just recently I saw that LinkedIn was allowing MOOC participants to add completion badges to LinkedIn profiles. I was a little sceptical of the vendor marketplace as I thought it might be a huge sell of with aggressive sales folk. I actually found the marketplace to be incredibly laid back and welcoming. I enjoyed strolling through the vendors and seeing what was on the horizon and talking to vendors we already work with. In addition to the established vendors there was also a startup vendor marketplace, which showcased new innovations from young entrepreneurs. All in all a great conferencing experience at EDUCAUSE 2013. The conference was impeccably well organized and there was value in 75% of the sessions I attended.